"Oh, Dakuwaqa!" - The Shark comics and cartoons: So much for being punch proof! So much for being punch proof! 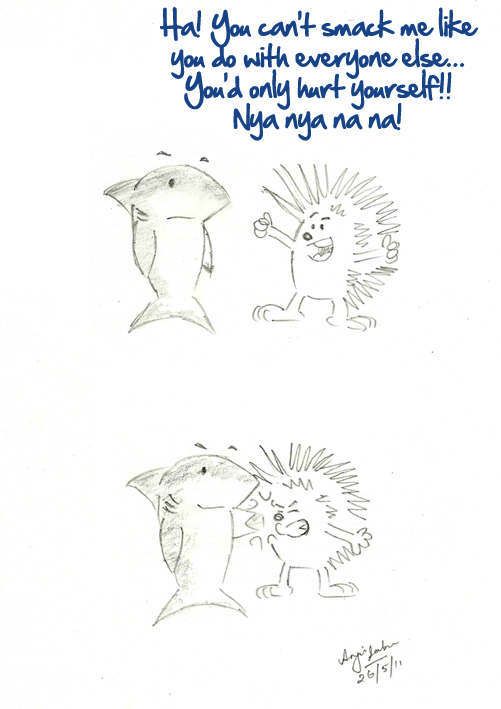 There are actually two porcupine-ish characters in my cartoons - each inspired by a different friend. This one is for a friend whose birthday it was yesterday. Actually, I drew it this morning but dated it as yesterday (In my defense, I had the idea last night). You know, I needn't have even revealed this information and let you think I'd actually drawn it on time for someone's birthday. It's because of personality flaws such as this that I wouldn't make a good politician. The friend involved has this weird notion that I used to beat them up when we were younger. I have no idea what that's about... that doesn't sound even remotely like me!